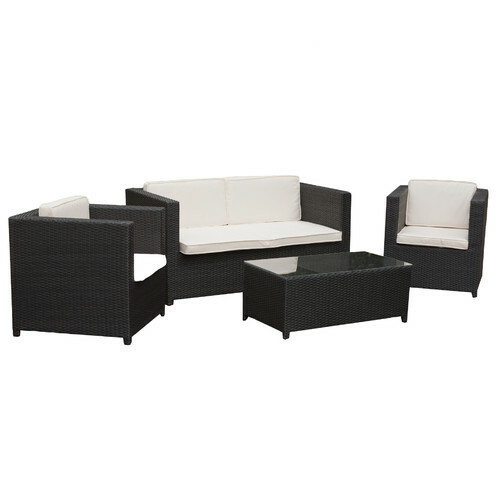 Style your outdoor setting with this complete outdoor lounge set. It's made of sturdy polyethylene wicker on a rust proof aluminium frame; the polyethylene wicker is hand woven, UV resistant and weather proof, making it ideal for outdoor use. The set features 2 x single armchairs and 1 x 2 seater sofa, and a glass table top coffee table. The cushions are 6cm thick and feature polyester covers and wadding. Entertain and relax in style by the pool, on the patio or in the garden with the stunning 4 piece Sorrento set. 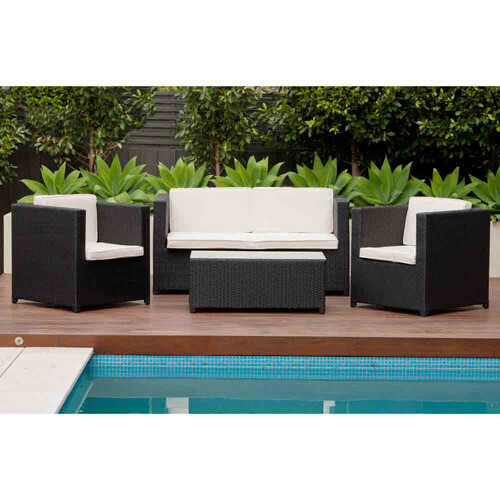 When you buy a 4 Piece Sorrento PE Outdoor Wicker Lounge Set online from Temple & Webster in Australia, we make it as easy as possible for you to find out when your product will be delivered to your home in Melbourne, Sydney or any major city. You can check on a delivery estimate for the Temple & Webster Part #: HDSP4BKW here. If you have any questions about your purchase or any other Outdoor Sofas & Lounge Sets product for sale our customer service representatives are available to help.Whether you just want to buy a 4 Piece Sorrento PE Outdoor Wicker Lounge Set or shop for your entire home, Temple & Webster has a zillion things home. Looks Great!! It's cheap and made from plastic so not sure how long it will last but it looks really good on our deck. It's small and so fits the space perfectly. Good quality and no assembly required!! Looks great in my patio . 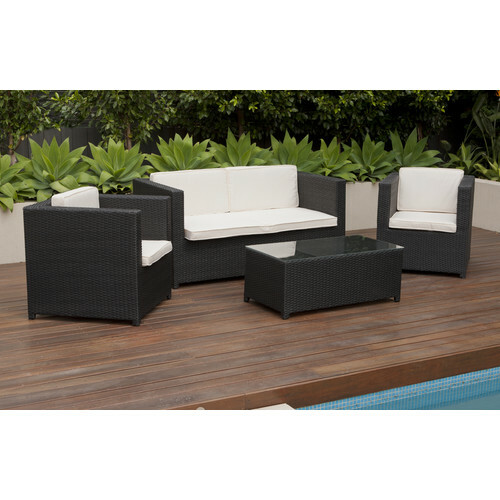 After spending an afternoon looking around ALL the usual furniture stores around Sydney for a nice outdoor lounge set we returned empty handed as they were either all too big or too expensive, I then went online and found this set and ordered it. The delivery was so quick and there is no assembly required, it looks stylish and is comfy too. So far no complaints, at this price I do not expect it to last forever but I am super happy with the quality, look and feel. We have also just received our outdoor furniture which looks fabulous on our deck. Not sure how well it will wear especially if it happens to get wet. At this price we are very happy. what a beautiful set! thanks team. very happy woth our purchase. Quality is very impressive. Resort style living! !